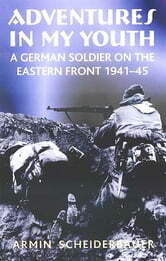 The personal memoir of a Nazi soldier, from joining the German Army in 1941 through his time as a Panzer on the Eastern Front. Originally written only for his daughter, Armin Schedierbauer’s Adventures in My Youth chronicles his time as a solider during World War II. As an infantry officer with the 252nd Infantry Division, German Army, Schedierbauer saw four years of combat on the Eastern Front. After joining his unit during the winter of 1942, he was wounded six times and had firsthand experience of the Soviet offensives in the summer of 1944 and January 1945. While fighting in East Prussia, he was captured by the Soviets and not released until 1947. Schedierbauer was only twenty-one years old when the war ended, and his memoir recollects the experiences he went through as a young man on the front.